Munnar was ranked as the #1 hill station in a poll by Outlook Traveler and it had also gained second spot in a round-up of vacationers’ most-preferred Asian travel destinations compiled by online travel guide TripAdvisor . With its sprawling tea plantations, pristine valleys and mountains and cool air, it’s no surprise that Munnar rated so high with holiday-makers. In recent years, it has also been attracting adventure travelers, who are enamored by the area’s stunning topography, which is ideal for paragliding, trekking and rock-climbing. If you are planning a trip to Munnar to enjoy one of the Munnar Holiday Packages here is a Munnar Tourist Map of major tourist attractions in Munnar which will come in handy. 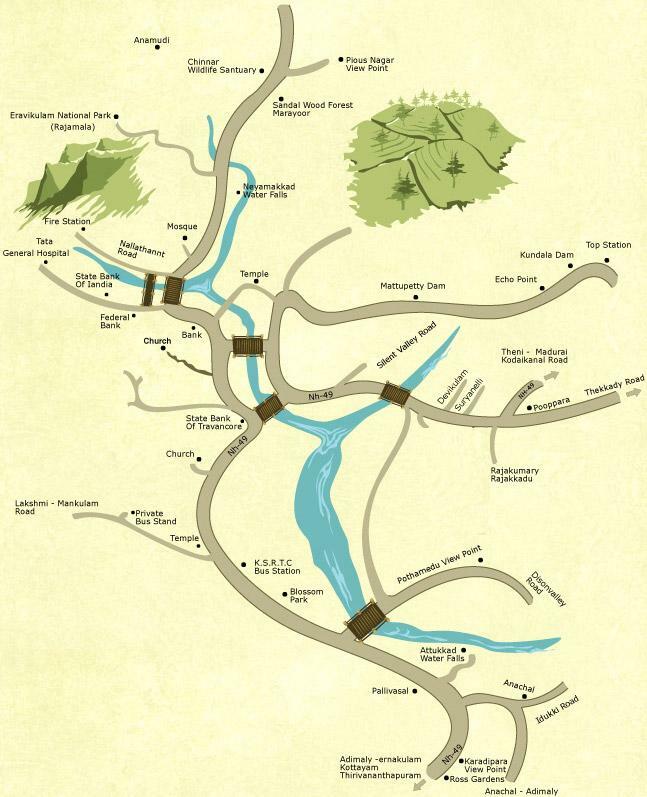 If you want to download the munnar tourist map guide right click and save the image of the munnar map above.